After 18 month of development and local fieldtests, the SECUSOL system is now launched officially to the North American market. 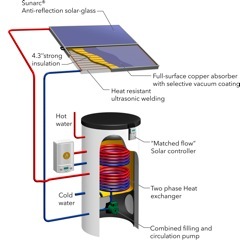 SECUSOL is an active, close-loop hyprid solar thermal system with an integrated drainback function using proprietary technology to elimnate stagnation or freezing. September 2011, Solar Thermal systems have been the passion for Wagner & Co,Germany, since 1979. With the start of theUSoperation in 2010, Wagner Solar Inc. has adopted selling solar packages to itsUSoperations right from the start. Customers can purchase turn-key, pumped, indirect, pressurized solar thermal systems either for DHW or Space Heating applications. Systems solutions pre-engineered for arapid installation. SECUSOL is a solar thermal hyprid system. A close-loop, indirect installation without the need to pressurize the system because of a proprietary drainback function. SECUSOL elimates the need of a pump station and expansion tank to account for stagnation. The storage tank, with an integrated drainage reservoir, receives all fluid from the collectors and solar piping loop when the solar pump is idle. A „matched-flow“ solar controller, pre-programmed with factory settings, accounts for on-demand operation. A 66 or 92 gallon solar tank with either one or two collector packages allows for approbriate sizing for any climate and hot water usage. The SECUSOL systems is preassembled at the Wagner factory to cut the installation time to 4-6 hours. Combined with the highest SRCC rated collector, the EURO C20 AR-M, the SECUSOL solar thermal appliances is expected to be one of the best performing solar systems on the market and yet affordable because of 50% reduced system and installation cost. SECUSOL is sold direct through a dealer/installer network. Installer training is required under the WagnerAcademy to become a SECUSOL dealer. Wagner & Co Solar Technology has gained technology leadership with ready-to-market solar thermal packages and received numerous awards. The company also came out first in many annual product tests by the independent consumer-testing agency “Stiftung Warentest” for the design of highly-efficient and cost effective solar thermal systems. Wagner & Co Solar Technology is well known for its EURO solar thermal collector line, among themEurope’s most efficient flat plate collector. The EURO collector line is the best performing solar collector in the North American market.